Americas eShop Update: It’s Monster Hunting Time! Nintendo Download: It’s Monster Hunting Time! 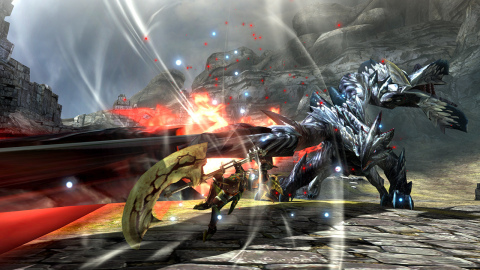 Monster Hunter Generations Ultimate – This critically acclaimed action RPG series makes its debut on the Nintendo Switch system. Choose from 14 different weapon types, mix and match them with unique Hunting Styles and Hunter Arts, or even play as an adorable but ferocious Felyne in Prowler Mode. The Monster Hunter Generations Ultimategame features the largest cast of monsters for any game in the series, from returning fan favorites to mysterious never-before-seen monsters. Monster Hunters Generations Ultimate will be available on Aug. 28. A free demo of the game is available to download now on Nintendo eShop. Blade Strangers – A malevolent force known only as Lina is devouring data from a vast, interdimensional network of servers overseen by sentient computers called “motes.” In desperation, the motes summon heroes from a variety of parallel game worlds to face off against each other in one-on-one combat. Fighter roster includes popular characters from previous Studio Saizensen and/or Nicalis games, including Code of Princess EX, Cave Story+, the Umihara Kawase series, and The Binding of Isaac: Afterbirth+. Other surprise entrants include the well-known indie superstar characters, Shovel Knight and Gunvolt. The Blade Strangers game will be available Aug. 28. Prison Architect: Nintendo Switch Edition– In the Prison Architect: Nintendo Switch Editiongame, you will see the impact of your grand design on the lives of your inmates, be it a utopic center for rehabilitation, a brutal Super Max Prison, or anything in between. Acting as both architect and governor, you control every detail of your Prison – from building new cells and facilities to hiring staff and creating reform programs – all while dealing with informants, contraband smuggling, gang warfare, full scale riots and more!